Haaahahahahhahaaahaha you are so wrong Skiriki!! Lovely picture Kalazar how did you get the mane all the way up the neck on the grazeing horse?? It falls that way when you apply the grazing pose. i am really on the fence about the horse right now. Im not at home so I cant load the old one and remember how it looks. hard for me to decide at the office (where I actually do most of my shopping....) for this decision I need to be at home. I downloaded the horsey UVmap tool from CauriB (thank you) but I forget how the RTE encode stuff works. Can someone remind me how that works. Let me assure you that the new horse looks GOOD when compared to the old one (and I have some extra bells and whistles for it in an attempt to make it look better). Yes, Danish and Norwegian languages are very much alike. Now that there's a nice new horsie in the paddock - could I put in an old request ? 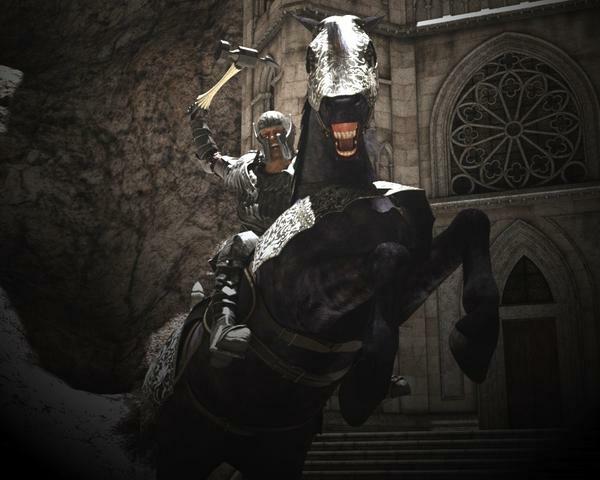 How about some talented person producing an ACCURATE Medieval Saddle and Barding ?? Fantasy stuff is all very well and good, in it's place, but I'm sure there's lots of us who'd like to produce some renders of realistic medieval scenes. And while we're at it..how's about a realistic pack-saddle and cargo, plus realistic ..workable..harness ?? I think the old horse was fin- if you didn't try to pose anyone on his back! The mane was an issue... .But this new mane does have the bald spot! I love your picture Kalazar! where did you find the dapple skin? Did it come with a pack.... I admit, I only bought the basic bundle. I read some older posts here saying that some of the Daz Horse 2 Pro Bundle installers are missing and/or incorrect. Are all Daz Horse 2 Pro Bundle installers correct or not? They seem to be OK now. Can these all be used in DS4 please? I don't want to upgrade to 4.5 yet so don't want to buy it and find I can't use it! At least the basic horse sez "1 DAZ Studio Legacy Installer", which is usually used to refer to 4.0 installer. I would, however, wait for someone else to confirm it better, since the Pro bundle is a bit messed up at the moment so I can't fully confirm it for you. Upgrading that is MY choice! I was under the impression that it should work Apparently I have misunderstood the version part of DS4-BUT if it does work in my version of DS4 would someone kindly tell me how to make it work. And I do not have poser. 2) Run Rtencoder and from the File menu choose Decode. Locate the file you want to decode (in this case Horse 2 Mil Horse UV and Clone.rte. 3) Once you've selected the file to decode, click Next and specify a name and location for the new zip file. I created it in the unzipped folder from above, and called it Horse2MilHorse.zip. 4) Click Next again and you need to provide a key. In this case, the readme says to use blmilhorse.obj (which should be in your Runtime\geometries\DazAnimals folder). You only need the one key. 5) Click Next. and then Finish. 6) A zipped folder should be created. Unzip it and copy the contents to your DS content folder. 7) I can't remember if it was enough to just refresh the content folder. You may have to restart Daz Studio to get it to all work properly. But when it works, in your Daz Horse 2 folder you'll find a folders for applying the mil horse textures, and when you load a mil horse prop/figure with Daz Horse 2 selected you'll get the autofit dialog. Choose the Mil horse as the original figure. It did not have "Legacy" installer? Huh, when I wrote that, it did say differently. Listing DS4.5/PP2012 etc as requirement. So, um. If you don't want to upgrade, then you probably want to contact sales via Zendesk and get your money back. Thanks for your reply on this- I will keep it I do plan on upgrading but not *soon* -Just rather disappointed that DAZ didn't make it to work in DS4 also *after All DS4 isn't that old of a program YET*. So, I will just droool on other ppl's renders of it. In this case Daz should have kept that installer in the downloads How is this right? First ppl that purchased Horse2 got this installer but the ones of us late on purchasing Horse2 don't get that installer? Just my opinion but this isn't right. My own Reality-based render is still going on. :/ 25th hour, now. I might have set the image size a weebit too big, but I don't want to stop now. Edit: I think the Legacy installer was listed by mistake. 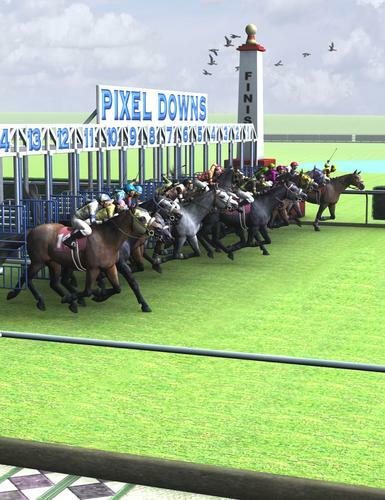 Are the Pixel Downs racetrack and Nerd3D's starting gate still to come? I haven't been able to find them in the store. I checked his Cornucopia-page to see if he have them there, but no such luck. And there isn't any race-tracks in the DAZ' store either. With some decent close-up details and textures would be nice. Pixel Downs and the starting gate are probably a week or two away-- they were both submitted to DAZ yesterday and have a few hoops to jump through (or a few furlongs to run) before you'll see them in the store. If you'd like to see more images, I've posted some here. In order to create that 14 horse field, I needed 9 more jockey silks, so I ended up creating them for my render. If you have the jockey set, I've provided the textures I did for the silks and posted them in my freebies. I patterned many of them after famous Kentucky Derby winners like Gallant Fox, Secretariat, Seattle Slew, Affirmed, Whirlaway, Count Fleet and War Admiral. Ditto. I mean it's shiny and all but how much would I really use it?